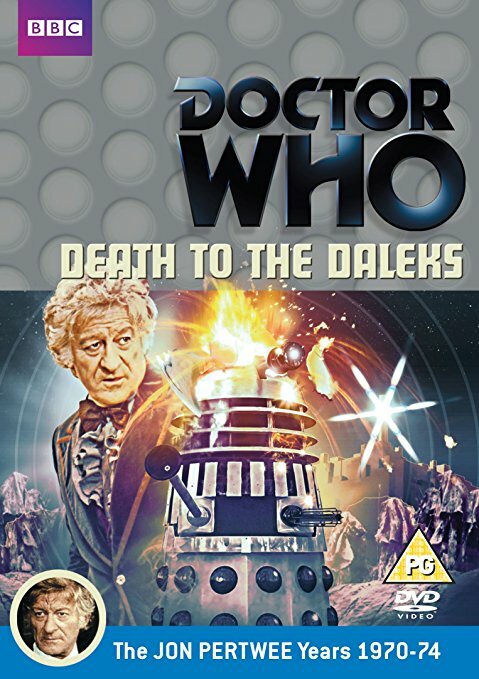 Jon Pertwee’s final year as the Third Doctor continues with ‘Death to the Daleks,’ his final confrontation with the Doctor’s most iconic foe. Much like in the rather traditional ‘Planet of the Daleks’ in the previous year, this serial sticks to the basics, offering some of the most familiar Terry Nation tropes while suggesting that the Daleks are in need of a major rejuvenation to lift them out of the lull they’re currently experiencing on the programme. The foundation for this episode is solid, but it never proposes a true reason for why the Daleks have to be present other than their iconic status. An advanced society regressing into a primal state after its self-aware city cast its inhabitants out amidst the universe itself dying from a devastating plague is all incredibly powerful background information that instantly elevates ‘Death to the Daleks’ to something more than a typical good-versus-bad tale. Unfortunately, the implementation of these concepts is somewhat lacking, perhaps most egregiously with the supposedly complex series of puzzles and deadly ploys the Doctor is tasked with solving that he quickly disposes of with little trouble whatsoever. The idea of the Exxilons visiting ancient Peru is also an intriguing piece of information, but it never gets explored or even mentioned again after a single quick line. It’s understandable that Terry Nation tries to keep an air of familiarity about his Daleks and the stories in which they feature, but it also results in ‘Death to the Daleks’ feeling as if it is following a set formula and plot progression. Even the powerless TARDIS is a concept familiar from the previous Dalek serial, and there are too many moments of padding to fill out the running time. That said, the Daleks also being drained of power makes for an intriguing notion that has rarely been explored up to this point; Nation decides not to explore what a Dalek unable to be a Dalek is, though, instead opting to have the Daleks find substitute weaponry and be just as strong or weak as the script needs at any given time. The Daleks in general suffer from haphazard characterization, and it’s difficult to know exactly what their status in the universe is at his point in time as they try to defeat the miraculous city since they are certainly not the single-minded and almighty forced depicted earlier in the programme’s history. The end result is a rather generic adventure that simply doesn’t capitalize on the Daleks. The Daleks work best when the story is written for them specifically, but here it seems as though the Daleks are an incidental foe with a role that any alien menace could have filled just as successfully. With Nation unable to add anything new to his writing or the Daleks’ characterization, this third annual Dalek tale is enjoyable but never manages to escape the sensation that there is something more interesting just beneath the surface of what is presented. Jon Pertwee remarked on several occasions that he did not particularly enjoy acting against the Daleks, and though he’s as charming and engaging as ever, ‘Death to the Daleks’ ultimately does little to offer a strong argument against that sentiment.